The sun was gradually setting on a beautiful spring evening, lowering in the sky with the last few rays making their way through the church windows and reflecting off of the large icons on the inner dome of the cathedral and behind the altar. The white stone walls, the red clay roof, and the blue of the dome combined with the colorful sky to resemble a picturesque church set on a Grecian island in the Mediterranean. There, just as here across the Atlantic, Greek hymns and the words from the Scriptures were being heard and reflected upon during Holy Week. As those words sunk in, both in English and Greek, and the last rays disappeared as night emerged, there was a calming and peaceful ambiance inside the church. After a long day of work, the fellow parishioners, the words and teachings, and the reflective atmosphere reinvigorated the mind, the body, and the soul. 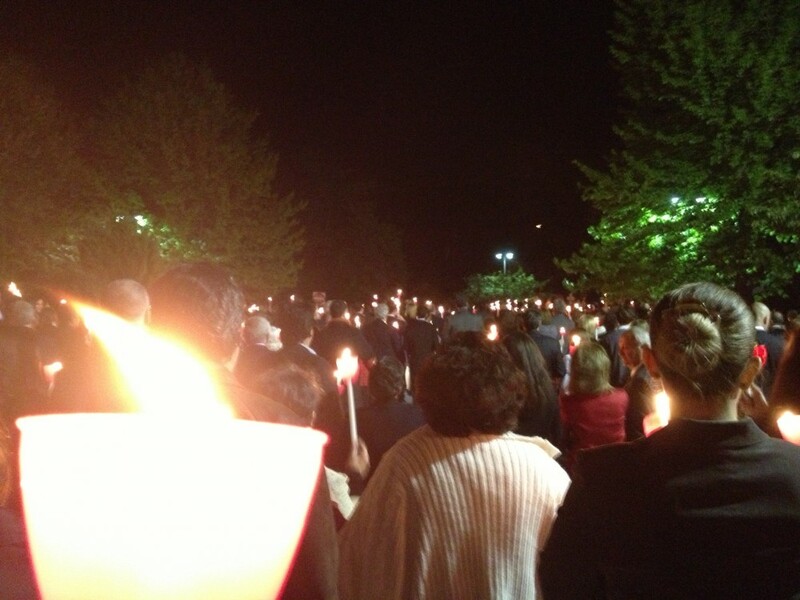 It was a long week, but it was an important one too, for Holy Week – culminating in the Resurrection and Divine Liturgy at midnight on Saturday night – represents the core of Christian beliefs, and for Orthodox Christians, that week fell five weeks after the same one for all other Christians this year. “Doesn’t it seem a bit ridiculous that we celebrate the death and resurrection of Jesus on different days; after all, he did only die and rise once, right?” That thought and question from a Catholic friend lingered in the back of my mind throughout Lent and as I sat there in the pew listening to those words and watching day turn to night. It was a genuine question, not asked to critique one set of beliefs in relation to the other; rather to understand the difference, its origins, and what it meant. And it was a question that proved to be both informative and revealing as I sought the answer. Every time I go to church, I learn something new and I reflect on how that message stemming from Christian beliefs can be applied to the diverse world we live in, regardless of one’s beliefs. This year, I tried to find an answer for my friend that went beyond the technical research. As shown below, there are numerous belief systems throughout the world. However, despite many differences, there are many transcendent similarities common to humanity, regardless of religion. Last year, as I wrote in this article, At the Crossroads of Progress & Tradition, I found this message from Gandhi, who was referenced in a speech I heard by Patriarch Bartholomew and whose words were shared in my cathedral back home during Lent, truly profound: “The weak can never forgive. Forgiveness is the attribute of the strong.” Gandhi, a Hindu, delivered a message that was meaningful to all of humanity, including the Christians in our cathedral. This year, as I attended the last of five Friday services during Lent devoted to the Virgin Mary, I learned that we rejoice in her being there for us; to console and comfort us in difficult times, to aid us with our ailments (pertaining to both the body and the soul), to be the human intercession between this world and the heavens. I looked at her icon behind the altar, the Theotokos (Θεοτόκος – “God-bearer”), with her arms wide open ready to embrace us, and I thought of how we all need people in our lives to be there for us, to assist us, to console us, to confide in, to comfort us, to allow us to make it through adversity, for this world will surely present its challenges and difficulties. It became apparent to me that, no matter if you are Christian or not, we all need those people in our lives who are welcoming us with their arms open. Sometimes we may even be that person who someone else turns to for help, and we need to be able to keep our arms open to welcome that person in. Likewise, directly above, an icon of the Christian savior, Jesus Christ, glistened in the final minutes of dusk. It was Holy Week, and we were celebrating His death and resurrection, His sacrifice to save us; His life, death, and resurrection lighting the way to salvation in what can be a very dark world at times. One aspect – the sacrifice – resonated with my mind and soul the most this past week. In order for this world to function, we have to sacrifice. As shown above, there are many different ways of life around the world. If we only concentrate on our own, and do not sacrifice some of our individuality in order to understand and accept others, there is no chance of coexistence. We need to sacrifice in relationships – whether it is with friends, siblings, partners, etc. – for those relationships to survive and thrive. We sacrifice everyday on a micro level, but on a macro level, that sacrifice leads to greater tolerance and understanding and less oppression and persecution. This year, Orthodox Easter happened to fall five weeks after the Easter in which my Catholic friend celebrated. Her question was not only valid, but eye-opening. It made me realize that not only are there differences between our world religions, but there are also differences within those religions themselves. Even within Christianity, there are numerous denominations that have theological or traditional differences, their significance varying across sects. But just as Gandhi’s words have meaning for Christians, Christian teachings and beliefs can have meaning for all those around the world. Despite the differences and technicalities that may lead to the celebration of Easter on different dates, the underlying meaning behind those events and beliefs transcend those differences and permeate throughout all of humanity. While pondering that question from my friend, although I have found the reasons for the divergence in dates, I have realized that the meaning behind those events remain the same. That meaning is pervasive, spreading across the world and among all belief systems, for forgiveness, acceptance, sympathy, and sacrifice are not unique to Christianity, but, in fact, common and crucial to all of humanity. Identifying the differences, understanding the reasons for them, and then realizing the commonalities that overshadow those differences can lead to a more peaceful world. Χριστός Aνέστη to all fellow Greek Orthodox Christians and Happy Easter to all Christians, regardless of the date upon which is celebrated. There are differences among the various denominations of Christianity, and there are vast differences among our numerous world religions. Recognizing those differences and understanding them along with the common themes, values, and meaning that underlie each of them – and are in fact common to humanity – makes for a more tolerant, accepting, and peaceful world. *Source: CIA World Factbook, World Religions. Population estimates as of 2010.